This polymer clay tutorial explains how to sculpt tiny Lady's Slippers (or Paphiopedilum) orchids, how to make the leaves with different shades of polymer clay, how to apply these sculpted details to a sea glass base, and how to do simple wire-wrapping of the sea glass pieces. 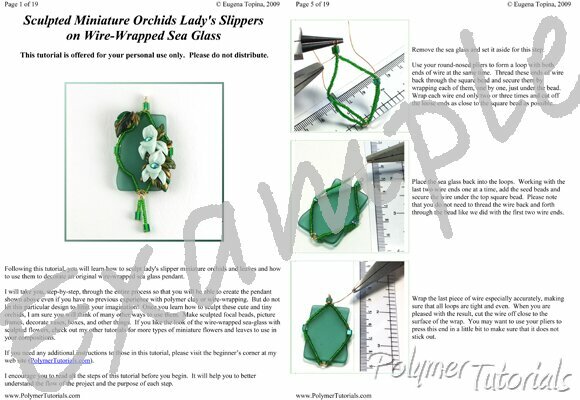 Bonus material includes instructions for a faux sea glass (made of polymer clay, of course!). The first two pictures on this page show the project described in this tutorial. The last two pictures demonstrate the possibilities of the techniques explained in this tutorial. Place a mouse over the small pictures to see them enlarged. Very thorough and clear instructions and pictures throughout ..